Reluctantly, I revisit the Trump-Clinton campaign, with the excuse that it is not only dominating news and comment more than any election I can remember, but is eliciting astonishing and irrational responses from sensible people. Normal people who are kind to children and domestic animals and enjoy good music erupt like malfunctioning cuckoo clocks over this subject. Noisy little birds debouch from and rush back within their heads, slamming little doors behind them, every two seconds, and this continues for hours. Donald Trump is usually the ostensible cause for apparently normal people to turn for prolonged intervals into babbling idiots, but Hillary Clinton can induce worrisomely sociopathic responses also, and the combination of what political analysts call "the negatives" has sired a new and unpromising mutation of bilious political comment. Because the two candidates are so challenged, this is an election where either nominee can only be imagined to be electable when considering the alternative. When I first followed U.S. elections, they were contests between plausible alternatives: Dwight D. Eisenhower and Adlai E. Stevenson, Richard Nixon and John F. Kennedy. In 1968, Nixon, Hubert Humphrey, Lyndon Johnson, Robert Kennedy, Nelson Rockefeller, and Ronald Reagan, all substantial men, were all candidates. In later years, Goldwater, McGovern, Carter, Dukakis crept in, and after the relatively respectable campaigns with Bill Clinton and George Bush Sr. and Robert Dole, which Clinton won because Bush allowed the lunatic billionaire Ross Perot to split the Republican vote, we have been crossing the desert. This is the core of Trump's appeal - he has never sought elective office but has huge name recognition, great charm to those susceptible to his confident and voluminous manner, has been a competent administrator in a tough business, and like most great modern American politicians, from FDR to Reagan, he is a showman. He had nothing to do with the 20 years of fiscal and foreign policy mismanagement that causes two thirds of Americans to think their country is heading "in the wrong direction." 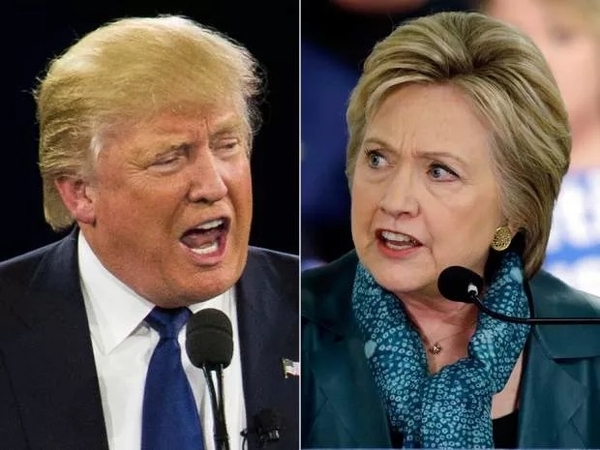 Even when an incumbent has been running for president, there has rarely been such a contrast between continuity and change as there is between Clinton and Trump. Over the last 50 years, America has gone from the practice of putting up two qualified candidates for leadership to one who is and one who is not, to two who are not, to one who is qualified for those who are prepared to overlook decades of misgovernment and the most serious ethical problems of any nominee in history, and one whose chief qualification is that he has never run for office and rode to the nomination over the groaning corpses of the entire political and media establishment and every element of the conventional wisdom and experience of how to conduct such a campaign. The last stand of Trump's more perfervid and ingenious opponents is to acknowledge that Mrs. Clinton has her problems but embrace her as the last hope of continuity, which is precisely why Trump smashed all norms, humiliated all the pundits and political barons and is now pulling into the lead. My good and esteemed friends Bret Stephens and Andrew Coyne were diagnosed as afflicted by this syndrome last week. Bret Stephens wrote in his slot in The Wall Street Journal on Sept. 13, under the heading "'Never Trump' For Dummies." The title was more apt than Bret or the editors apparently imagined. In a faux-clever Q. and A. on the Platonic dialogue format, the Republican nominee was described as: "anti-conservative, un-American, immoral, dangerous ... unfit, as a person, to be president," an outright and psychotically litigious crook. "What Mr. Trump has achieved is not success, it's notoriety. He's rotten to the core ... Mrs. Clinton lies tactically to protect herself politically. Mr. Trump lies compulsively to aggrandize himself or belittle vulnerable people, whether it's a handicapped reporter or a bereaved mother." He lacks "a principled commitment to limited government, free markets, constitutional rights, equal opportunity, personal responsibility, e pluribus unum." That statement is completely false, but it gets worse. Bret wrote: "Trump's plan to end birthright citizenship runs afoul of the 14th Amendment. His threat to 'open up those libel laws' so he can sue his critics is a threat to press freedom. His attack on 'Mexican' Judge Gonzalo Curiel was an assault on the American creed." This is an "insight into Mr. Trump's mind. It betrays an instinctive illiberalism. That's why he attracts so much praise from Jean-Marie Le Pen and David Duke. It's why he keeps praising Vladimir Putin." I am confident that my old friend has not gone stark, staring mad, but it would be hard to believe that after reading that fulmination of quackery, imputative mind-reading, and outright falsehoods. All politicians lie sometimes; even Abraham Lincoln was foxily devious occasionally and liked a political ruse. For much of his career, if Franklin D. Roosevelt publicly told the truth, it was a coincidence, but all in a good cause, and in a world darkened and complicated by Hitler, Stalin, Mussolini, Tojo, and, as he called them, the "pious frauds" of Lindbergh and other rabble-rousers in the U.S. Donald Trump has been a successful developer of very high quality buildings and golf courses, an equal opportunity employer, an authentic capitalist and advocate of less government, lower taxes, and reduced concessions to special interest groups, and a law-abiding citizen. His birthright comments are like Ronald Reagan's nonsense about amending the Constitution to ban abortions, and over-riding New York Times vs. Sullivan and restoring the civil tort of defamation would be an assist and not a threat to a free and responsible press. The catechetical recruitment of the Khans at the Democratic convention was an outrage; it was Marine Le Pen, not her anti-Semitic father, who praised Trump, as has Brexit winner and courageous veteran Nigel Farage; and Trump hasn't praised Putin, he has said he could improve relations with him without abandoning the U.S. national interest, contrary to the shambles generated by the Obama "reset." Andrew Coyne managed a similar centre-court flip-out in this newspaper on Sept. 10. Trump's "whole career is a series of failures, frauds, and lawsuits ... He is not just dishonest. He lies more often than he tells the truth ... he has poured forth a stream of vulgarity, insults and open racism never before witnessed in a candidate for president." In fact, given his lack of political experience, his campaign has been one of the most brilliant in the country's history, whatever happens on Election Day. The tone of this campaign has not been more raucous than many in American history, including some of the scurrilous exchanges between Jefferson and Hamilton as they launched the country. Trump has been a very successful businessman, impresario, and television personality, even if it isn't the sort of television that Bret and Andrew and I watch. He does not have a racist bone in his body, and being involved in a lot of lawsuits does not imply unsuitability for public office, especially in the litigious lunatic asylum of the U.S.A.
Donald isn't everyone's dish of tea, and it would be worrisome if he were. Politicians receive and yield to more temptations to undignified behaviour than most, and as Bret Stephens and Andrew Coyne both emphasize, Mrs. Clinton is no candidate for sainthood. Richard Nixon, one of the most successful presidents in U.S. history, was crucified for less offensive conduct than Mrs. Clinton's. George W. Bush was a good governor of a state of 27 million people (Texas) and Barack Obama was a well-spoken senator from a great city (Chicago), ran an elegant and agile campaign, and raised the torch of distinguished African-American leadership, which was dropped with the assassination of Martin Luther King., Jr. in 1968. But they were both unsuccessful presidents. I think both Mrs. Clinton and Mr. Trump would have a less trigger-happy concept of the national interest than George W. Bush did, and a less ambiguous and flakey concept of it than Obama has. When tested, both would be rational and patriotic. Personally, I find Donald Trump a refreshing change from the bi-partisan elite of the Bush-Clinton-Obama quarter century that has generally failed. But we are discussing imperfect candidates, not evil or deranged people. We are all sinners, and democracies get the government they deserve. In that sense, the people are always right, and America could do worse, and has for the last sixteen or twenty years.